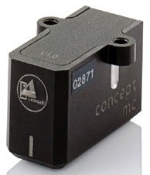 Moving coil phono cartridge. Pleeas call us or visit our Clearaudio Phono Cartridges web page for more information about this item and other Clearaudio phono cartridges. Package pricing available with Clearaudio turntables, including the Concept. Ships free to addresses in the USA.